HVAC cooling towers are typically smaller than industrial cooling towers, and serve more commercial applications such as cooling the recirculating water of oil refineries, chemical plants and power plants as well as cooling buildings such as large office buildings, hospitals, schools and oil refineries. HVAC Cooling Tower – Cooling Tower Systems, Inc. Through these applications and more HVAC cooling towers are able to serve industries including petrochemical, pulp and paper, commercial, construction, communications, water/wastewater and electric. An HVAC chilled-water system consists of a water-cooled chiller and its components, including an evaporator, compressor, an air- or water-cooled condenser, and expansion device, as well as a cooling tower that serves as an auxiliary cooling device. The water-cooled chiller is cooled by the water-cooled condenser in a separate water loop. This water loop is connected to the airside by an outdoor HVAC cooling tower that removes heat from the cooling water stream. 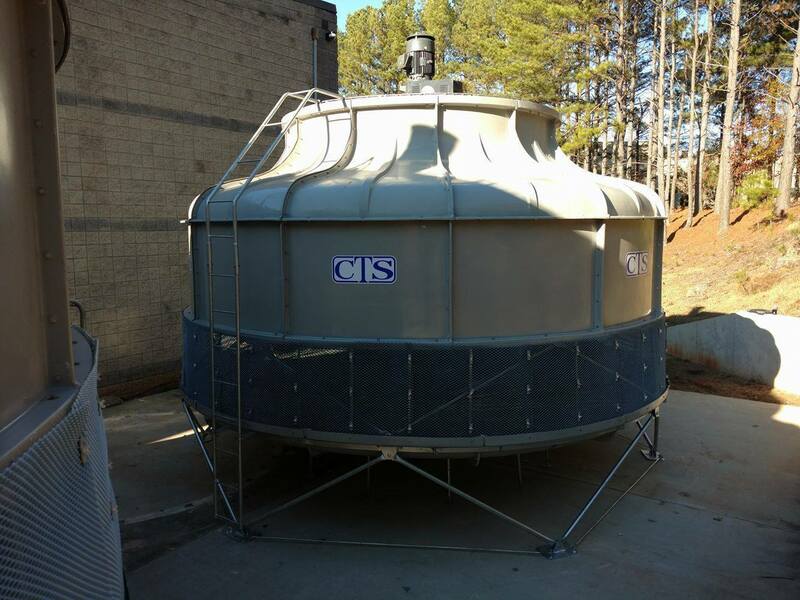 As a mechanical draft type of cooling tower, HVAC cooling towers utilize a power-driven fan motor to either coerce or force outside air to flow through the tower fill, a medium that is used to expand the amount of surface area between the air and water streams. Tower fills come in two different types: film fill and splash fill. In a film fill a thin layer of water is spread over several layers of closely-spaced plastic surface. In a splash fill water drops over multiple layers of horizontal splash elements and form droplets that cover a large surface area. The water is propelled by the power-driven fan to descend through the fill while being cooled through direct contact with an air stream passing overhead. After the water is cooled it is collected in a cold water basin that is below the fill, from which it is pumped back to repeat the water loop. The heated air stream leaving the fill is released into the atmosphere far enough way to discourage it from being pulled back into the cooling tower. 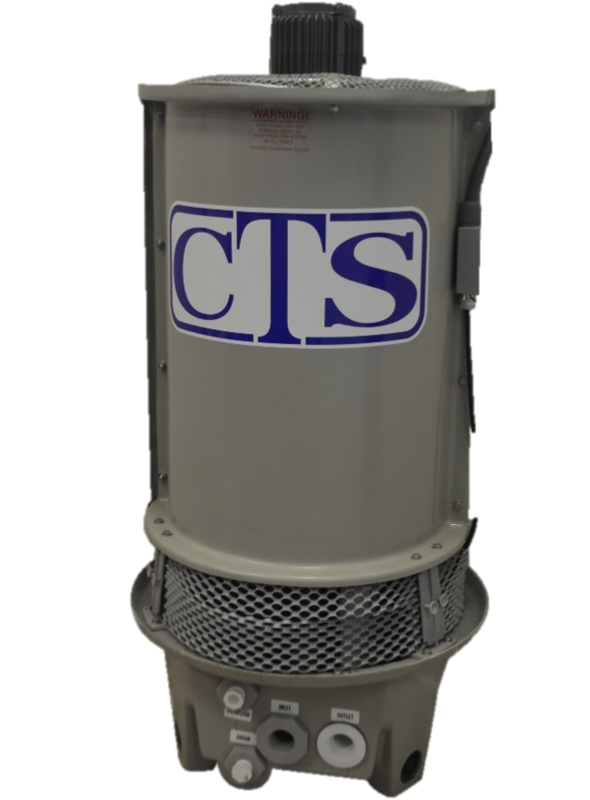 HVAC Cooling Towers Water-cooled chillers are used in HVAC cooling towers rather than air-cooled chillers because water-cooled chillers are typically more energy-efficient.